i am other is the philosophy that Pharrell carries through all of his businesses and charities. He told us that he only surrounds himself with people who share those beliefs and he tries to instill it in others through all of his projects in music, film, television, apparel, and what not. 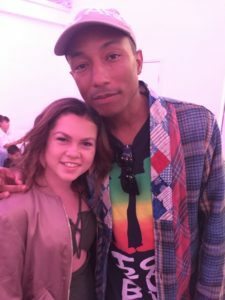 Somehow, someway, Pharrell, or Pharrell’s people found me, and invited me to a very special event to launch a collection of school supplies in partnership with Yoobi. Yoobi is a pretty cool company. They have adopted the idea that made Tom’s shoes famous. Yoobi takes a portion of everything they sell and give free school supplies to children in need right here in America. Pharrell helped design the line of school supplies around the themes of i am other. When you go to events like this, you have no idea who is going to show up. 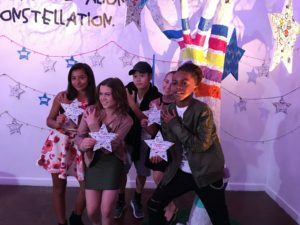 Somehow I was not surprised to see four other immaBEAST dancers, and even a few Disney Channel stars at the event. We all had a really great time, and it is super fun to get dressed up for the red carpet. Overall it was a super fun evening, and one I will remember for sure!